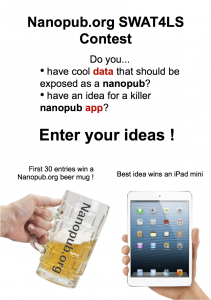 Send your idea to: competition@nanopub.org ! This year, at SWAT4LS 2012, we celebrated the kick-off of the nanopub.org community website. 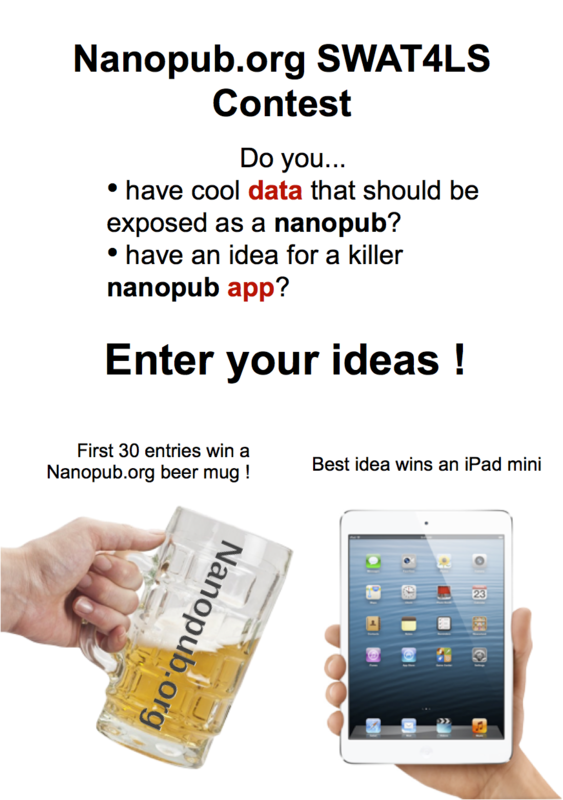 This was done in a friendly pub where everyone could discuss, share, critique and learn about nanopublications. All resources and information were provided freely by the growing community of nanopublication developers and data publishers. SWAT4LS hosted the very first Nanopublication competition: to join is easy! Look around on this website, browse the resources below and get a feel of what nanopublications are about. You will probably get some ideas about how nanopublications could be applied in your field, on your data or for your software platform. the winner will be chosen based on the criteria of creativity, originality, technical soundness, feasibility, applicability, etc. A very concise introduction is available in the About section and our Tiny Transactions publication. and our SWAT4LS poster abstract gives more background and motivation. and the validator can be used to check nanopublication RDF. Last but not least, come talk to us on the SWAT4LS workshop, hackathon, or tutorial days! Also, find us near our posters. We will be happy to talk to you about your nanopublication questions and ideas!